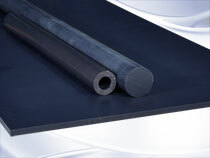 The first cast nylon to combine both molybdenum disulphid (MoS) and oil for the load capacity of Nylatron GSM PA6, plus improved frictional characteristics. It excels in higher pressures, and at low speeds-up to 40 fpm. It offers 20% lower coefficient of friction, 50% greater limiting PV, and a lower "k" factor than Nylatron GSM PA6, making it ideal for slide pads, thrust washers and trunion bearings. Nylatron GSM Blue PA6 should be considered for any oil-filled nylon application. It is dark blue in color.